Have you ever wondered who paints the wonderful holiday murals on local store fronts? If you have, you will want to check out 7 Cylinders Studio's short documentary Brush Monkeys. It's a brief look at the people who make all the wonderful seasonal murals around town. Gentle reader, tonight is the last #a2council meeting of 2019. Potentially the most exciting and consequential action will happen at the 6pm special closed session do discuss pending litigation. Oh to be a fly on that wall. There will be public commentary at this meeting, so if you can share your thoughts with council if you like. The main meeting has quite a full schedule. 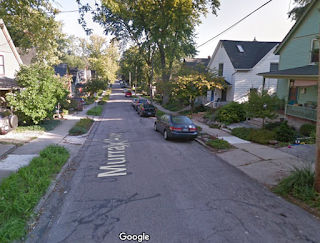 One thing I am interested in is DS-1, which deals with sidewalk gaps around Northside School. This resolution would fill sidewalk gaps leading to Northside School as part of the Safe Routes to School program. 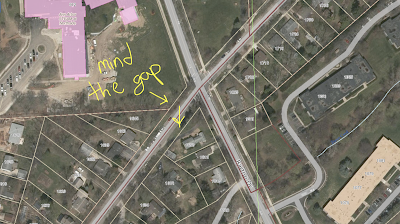 One of the largest gaps is along Traver road near the intersection with Broadway (see above). My hot take on this: Ann Arbor should fill all sidewalk gaps post haste. But, the current way we pay for this, assessing property owners based on the amount of sidewalk being built in their front yards, is pretty bogus. Residents on Traver are being assessed at $43/ft which comes to anywhere from $1,290 to $8,686. Sidewalks are an essential public good. Not only do they allow for children walking to school safely, they allow for improved mobility for people with some disabilities. 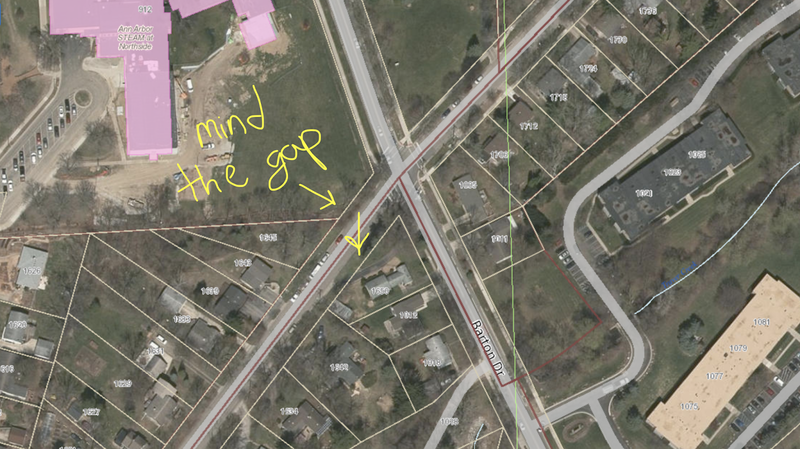 The city should pay to fill the sidewalk gaps. One of the spiciest items on the agenda may be DC-3, which would provide council with guidance on a survey to determine how to use the rebate from the County Mental Health and Public Safety Millage. The controversy around this issue probably deserves its own article, or perhaps someone in the comments will elaborate. My tl:dr is as follows: under the Mental Health and Public Safety Millage, communities that have their own police force (e.g. 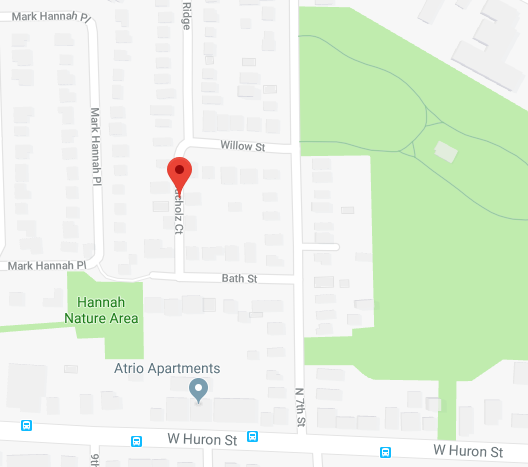 Ann Arbor, Ypsilanti City, Pittsfield Twp., etc.) get a portion of the money from the mileage back as a rebate. Previously council passed a ordinance/resolution saying that if the millage passed, they would use the rebate for pedestrian safety, affordable housing, and climate change (I think). The new majority on the council does not necessarily like this plan and they would like to conduct a survey and they are proposing to survey people in Ann Arbor to see how to spend the money. In general, I am skeptical about governing by SurveyMonkey. Maximillian Alvarez is an essayist and dual Ph.D. candidate in comp lit and history at U of M. If you don't follow him, you should. He is a great writer and I am excited to see how his ideas shape our future. Maximillian has recently made a foray into podcasting launching Working People. The podcast features working people, talking about their lives, their work, and their struggles. You can read more about the podcast in Maximillian's article in the most recent Current Affairs. Since GM's layoff announcement in late November, Working People has been focusing on the stories of GM workers at the factories that are being shuttered. The first special episode covered workers from the Lordstown Plant in Ohio. The most recent episode covers workers in Michigan plants including Hamtramck and Pontiac. You should listen to all the podcasts, especially the episodes covering the GM layoffs. I think it is really important to hear these stories, and not to just think of these workers as numbers. So often blue collar workers are portrayed as unintelligent and ill informed--people who can't be trusted to make important decisions for their communities. What these interviews show is the depth of knowledge and understanding within blue collar workers and within the union tradition. You know, working on this urgent, multi-episode series on the GM layoffs has taken a lot out of me. I’ve been working overtime these past two weeks to put it together, talking to dozens and dozens of people, making contacts, following up on leads, researching and editing late every night, interviewing dozens more folks. But, to be honest, the hardest thing about it has been the emotional drain—I feel so depleted and angry and just … heartbroken. Every day, for two weeks straight, I’ve been talking to other working folks about the situation they’re facing, about the bleak and impossibly heavy reality that their lives are about to be turned completely upside-down … the reality that the very beating hearts of their communities are about to be ripped out. And we’ve been talking about how these layoffs lay bare the dire situation facing the working class writ large. It’s impossible not to feel drained after all that. And I know I’m asking a lot of people out there when I urge them to sit and listen carefully to these interviews. Because they’re going to stir up a lot of emotions. But that is necessary, for all of us—it reminds us that this is real. These emotions bring to the surface those trembling, vulnerable, human connections we have with our brothers and sisters. The pain and fury of listening, I think, comes from that raw, beating sense of duty we have to one another … to empathize with our fellow workers, to find solidarity in our shared struggle, to help shoulder their burden, because it’s our burden too—to stand with them and fight, together, against the forces that command and destroy and darken our world. That’s a big part of why I started this podcast in the first place. In however small a way, I hope the podcast can help to build a sense of class consciousness, a sense of common struggle, and a sense of solidarity among workers all around the country—people coming from all walks of life, working all sorts of jobs. And I believe that we cannot do that unless we actually do the tender, loving, patient work of listening to each other—like, really listening—and talking to each other in a way that affirms our shared humanity. Because, in doing that work, we will come to remember (or see for the first time) that life under capitalism is an unlivable, never-ending process of dehumanization, a process that reduces us and our neighbors, and our relations to one another, to the commodity form. And you can see this in the mainstream coverage of these layoffs, and pretty much any story having to do with the lives and struggles of workers. We are reduced to little soundbites and flat archetypes that can be deployed for the self-serving ends of people who do not have our best interests in mind. Our voices are either silenced or contorted to fit the narratives that buttress the very power structures that are grinding us into human mulch. And that is the other main reason I started this podcast. If workers are going to claw our way out of this endless cycle of exploitation and despair, then we’re not going to find the answers we need from the people and institutions that serve and benefit from the existing, horribly unequal arrangement of power in our society. We’re going to have to work things out among ourselves. And we can’t do that if we’re not actually talking to each other. If you listen to these episodes, especially those in the series on the GM layoffs, you’ll realize very quickly that these aren’t just sad, infuriating stories. These workers, who come from all over the ideological spectrum—they know the score. They know that little concessions and political band aids aren’t going to keep our communities alive. They have so much to say about the unsustainability of our political economy and what we need to do, collectively, to fight back. These are the conversations we need to be having with our fellow workers. And that’s what Working People is all about. Please, take a listen to this podcast, it's very good. 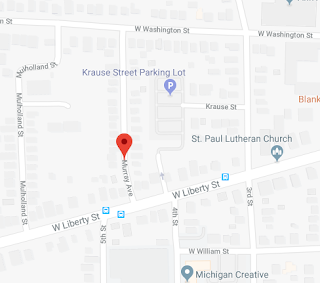 If two cars going in opposite directions can pass each other at more than 10 mph, on a residential street that doesn't serve any significant through traffic, the street is too wide. I think we should celebrate older neighborhoods that are built this way, and emulate the model going forward. It's cheap, it's effective, and it's simple—very few ingredients required. 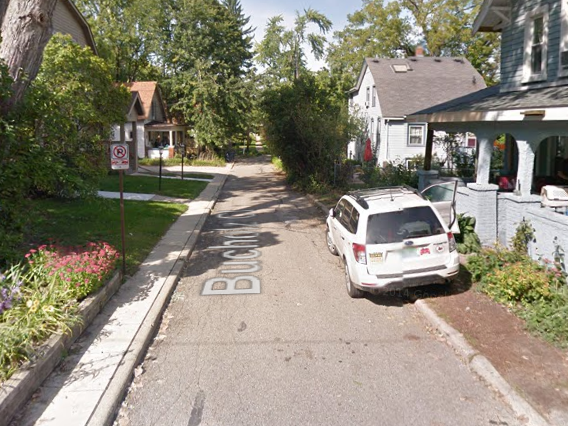 So where are the narrow streets of Ann Arbor? I recently biked down Bucholz Court, near West Park. * This street is a destination, with little plausible through-traffic. * The narrowness slows down drivers (both by making it “feel” slow and by making it hard to maneuver). * The one-way lane makes it easier to keep an eye on traffic. 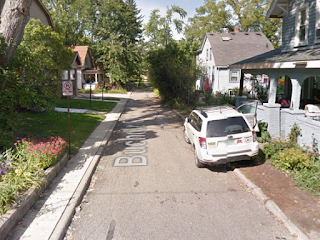 What other Ann Arbor or Ypsi streets are notably narrow or have that narrow feeling? 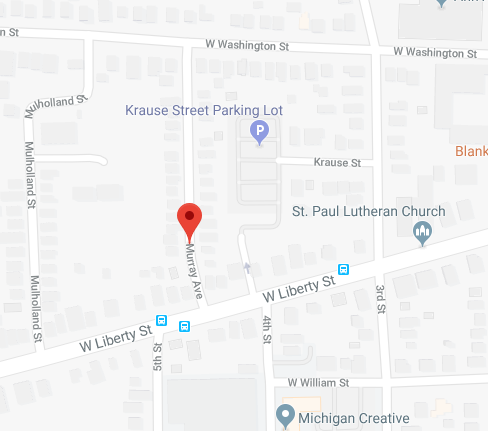 If you know of other similarly-narrow streets in town, please share in the comments. The Elves and the Schumachers at is an original pantomime by Carla Milarch and R. MacKenzie Lewis. The story is about two lesser known elves, Elmo and Bobby, who help a family of toymakers, the Schumachers, and save Hanukkah. Elmo, played by Sarah Stevens, is a "a non-important brother of Elwë" from Middle Earth. Bobby, played by Elizabeth Jaffe, is the younger brother of Dobby, the house elf from Harry Potter. With the help of the blue fairy, played by Dan Morrison, they help save the Schumachers from evil mayor Antiochus Gawp, played by Dan Morrison. It's a pretty silly show and in the tradition of the pantomime, a lot of it is aimed at being entertaining for younger children. That said there is plenty of fun for the adults in the audience too. I had never seen a pantomime before and The Elves and the Schumachers was a great introduction to the form. The show has many of the standard conventions of a pantomime including: An older woman played by a man in drag; risqué double entendre, often wringing innuendo out of perfectly innocent phrases that is, in theory, over the heads of the children in the audience; audience participation, including calls of "He's behind you!" or "Look behind you! "; and music made from well-known tunes with re-written lyrics. This all makes for a very fun show. In particular, I think the way The Elves and the Schumachers gradually broke down the fourth wall and ramped up audience participation was a ton of fun for the children in the audience. After the show ended, I overheard an elementary-aged student say "I never want to leave the theater." Indeed, I informally interviewed a few kids after the show and they all said they had a good time and most thought their friends from school would like the show. The Elves and the Schumachers features scene-chewing performances from Stevens, Jaffe, and Morrison. 20 minutes into the show, EJ's face hurt from laughing so hard. William Powers, a fifth grader at Haisley, plays Judah Schumacher. I think this is a really important element of the show because it gives the children watching it a real proxy for themselves. I think it also makes it so the kids who come up on stage at the end of the show more comfortable. 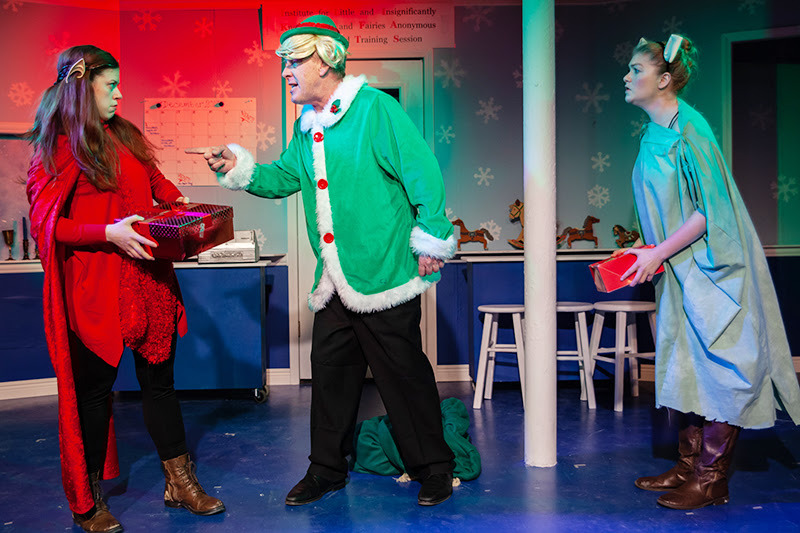 The Elves and the Schumachers is a silly romp that kids and adults will enjoy. The Elves and the Schumachers runs now through December 30th at the Yellow Barn. Shows are on Friday, Saturday, and Sunday. *I don't remember the exact quote from the Blue Fairy, but this is the gist of it. I feel like it's a good framing device.